The existence of a fifth giant gas planet at the time of the Solar System's formation – in addition to Jupiter, Saturn, Uranus and Neptune that we know of today – was first proposed in 2011. But if it did exist, how did it get pushed out? For years, scientists have suspected the ouster was either Saturn or Jupiter. "It's like something out of an interplanetary chess game." Astrophysicists at the University of Toronto have found that a close encounter with Jupiter about four billion years ago may have resulted in another planet's ejection from the Solar System. "Our evidence points to Jupiter," said Ryan Cloutier, a PhD candidate in U of T's Department of Astronomy & Astrophysics and lead author of a new study published in The Astrophysical Journal. Planet ejections occur as a result of a close planetary encounter in which one of the objects accelerates so much that it breaks free from the massive gravitational pull of the Sun. However, earlier studies which proposed that giant planets could possibly eject one another did not consider the effect such violent encounters would have on minor bodies, such as the known moons of the giant planets, and their orbits. So Cloutier and his colleagues turned their attention to moons and orbits, developing computer simulations based on the modern-day trajectories of Callisto and lapetus, the regular moons orbiting around Jupiter and Saturn respectively. They then measured the likelihood of each one producing its current orbit in the event that its host planet was responsible for ejecting the hypothetical planet, an incident which would have caused significant disturbance to each moon's original orbit. 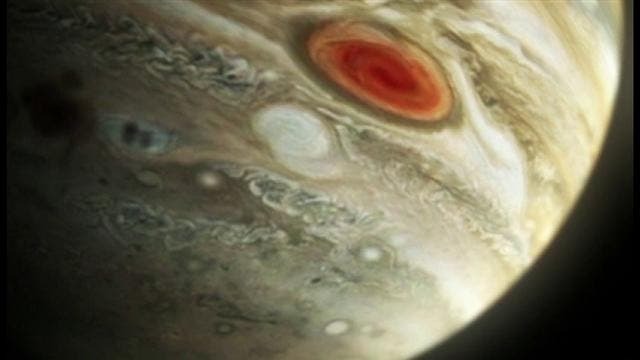 "Ultimately, we found that Jupiter is capable of ejecting the fifth giant planet while retaining a moon with the orbit of Callisto," said Cloutier, who is also a graduate fellow at the Centre for Planetary Sciences at the University of Toronto at Scarborough. "On the other hand, it would have been very difficult for Saturn to do so because Iapetus would have been excessively unsettled, resulting in an orbit that is difficult to reconcile with its current trajectory."